Providing you the best range of hydraulic gear motors with effective & timely delivery. Owing to our expertise in this domain, we are offering our clients a supreme quality assortment of Hydraulic Gear Motors. 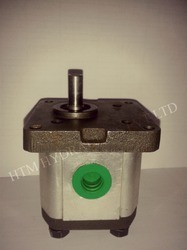 Offered gear motors adopt high strength aluminum alloy body, pressure compensated bushings with anti-friction. These gear motors are manufactured with precision utilizing top notch material & latest techniques following the industrial norms. Our offered gear motors are checked under the direction of quality controllers before supplying in the market. Different Mounting, Shafts & Ports. Single, Tandem & Multiple Outlets. Maximum Working Pressure 250 bar ( Aluminium body)/ 270-280 bar (Cast Iron Body), some sizes upto 275-300 bar.